I’m very excited about this recipe. 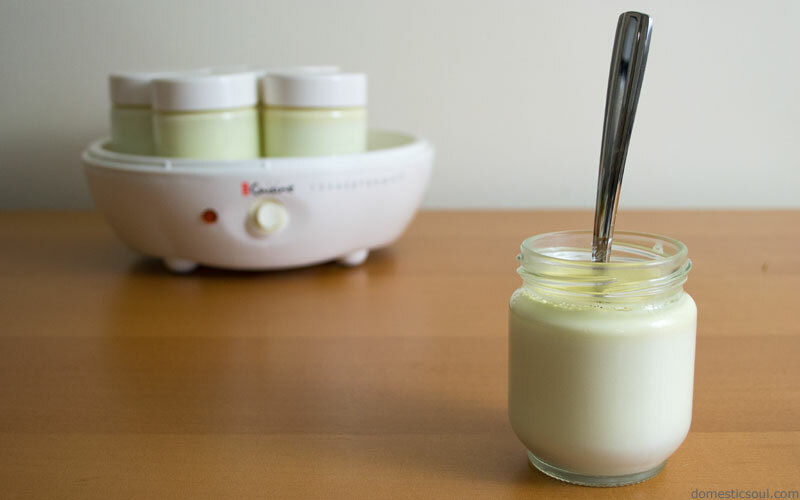 Raw milk yogurt – or any homemade yogurt for that matter – tends to come out a little runnier than standard store bought yogurt. There’s a reason for that, of course. When you make yogurt at home, generally you are making it only with milk and a culture. To keep their yogurt thick, yogurt from the store may contain all sorts of thickeners that might make you raise an eyebrow – “modified corn starch” anyone? Blech. Sure, if you want to make your yogurt thick, you could always strain it. This does have it’s advantages, like being an easy way to collect whey for fermentation. But the texture of strained yogurt can be a bit on the pasty side, depending on how much whey you strain out. So, what if you don’t want to strain your yogurt? 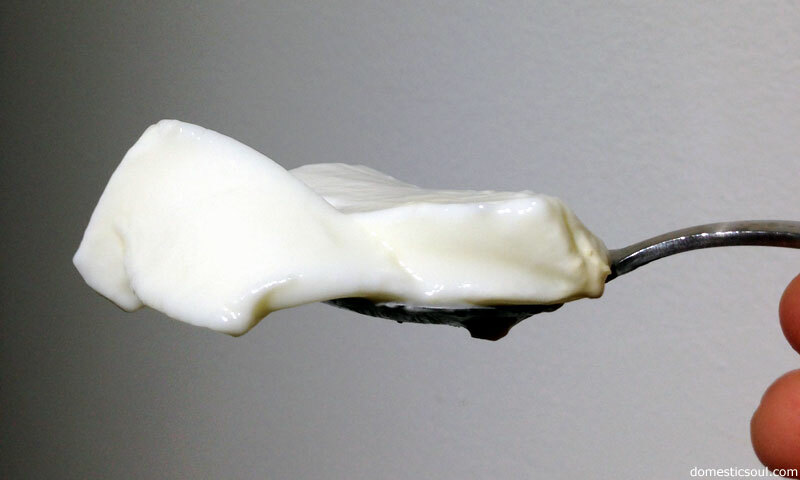 What if you want to ferment your yogurt to be nice and thick while keeping it’s creamy texture? What if you wanted to do all those things, and you also want to keep your yogurt healthy and natural? As it turns out, we can learn something from yogurt manufacturers. (Whaa?! I know!) 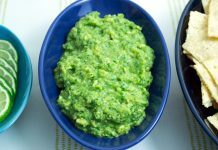 Adding a thickener to your yogurt doesn’t have to be a scary thing, especially when the additive is as healthy as gelatin. 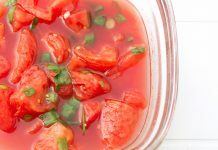 Gelatin is essentially animal collagen – it’s what gives Jello it’s wiggle, it’s what gives homemade broth it’s ‘meat jello-like’ appearance, and it also happens to be an excellent thickener. As for it’s health benefits, it’s one of the main reasons broth is recommended for people with digestion issues, it’s been used as a supplement to maintain healthy bones and joints as well as reducing arthritis, it’s recommended as a supplement for hair, skin & nails, and there have even been some reports (though anecdotal) that taken as a supplement it can reduce wrinkles. I purchased the Euro Cuisine YM80 yogurt maker. I love it. 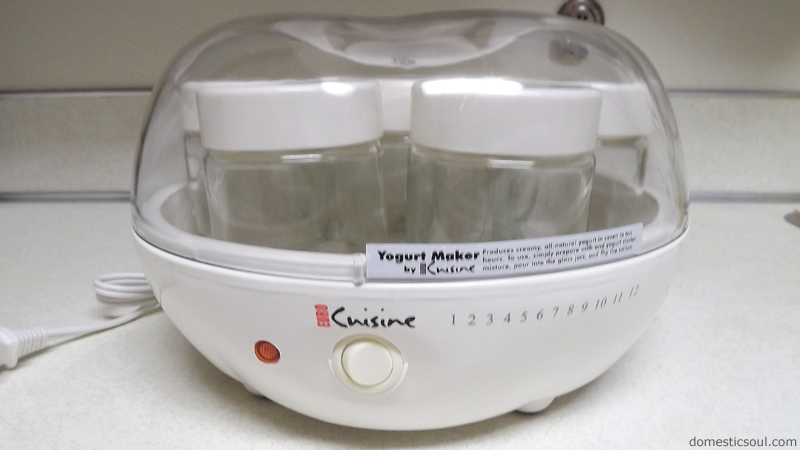 I think this is the perfect machine to make 24-hour SCD style yogurt, and I’ll tell you why. 1. It does NOT have an auto shut off. It looks like it does, but it doesn’t. This is a bonus for 24-hour yogurt. Most auto shut offs are somewhere between 8 and 12 hours – which means, for one batch, you would have to turn the machine back on 2 or 3 times. Without an auto shut off, I don’t have to think about it for a full 24 hours. 2. It keeps yogurt at exactly the right temperature the entire time. I saw one review for this model that said the temperature rose to between 130 and 140 degrees. That is totally unacceptable – especially for raw milk yogurt. However, I checked the temperature on my yogurt a few times and it never left the acceptable range. 3. It comes with 7 glass jars – perfect for portable yogurt. Ferment the yogurt in the glass jars, throw a lid on each one, store them in the refrigerator and then you can grab one on the way out the door as an easy snack. So, I’m a fan of this machine. If you are in the market for a yogurt maker, I highly recommend it. It makes an amazing yogurt! Stir to fully incorporate the gelatin. No lumps! Note about temperature: This is for raw milk yogurt. If you are using pasteurized milk, you should heat the milk 180 instead of 110 to kill off any bacteria. Then, let it cool to about 110 before adding the culture. Step 2: Add the whey and stir to incorporate. 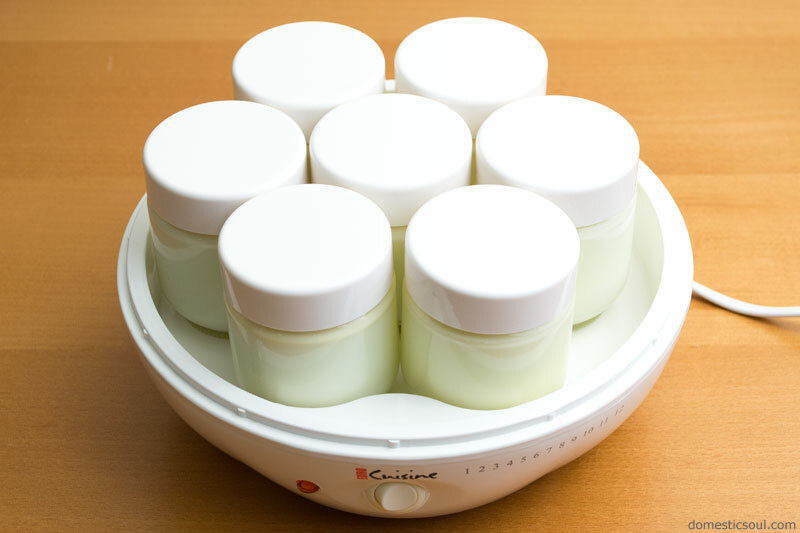 Step 3: Pour the mixture into the glass jars that came with the yogurt maker – each jar holds 6oz – leaving the jar lids off. Step 4: Cover the yogurt maker with the yogurt maker lid and turn on. Step 5: Let heat for 24 hours. Step 6: After 24 hours, add a lid to each jar and store in the refrigerator. It will thicken up nicely as it chills. Step 7: Eat and enjoy! 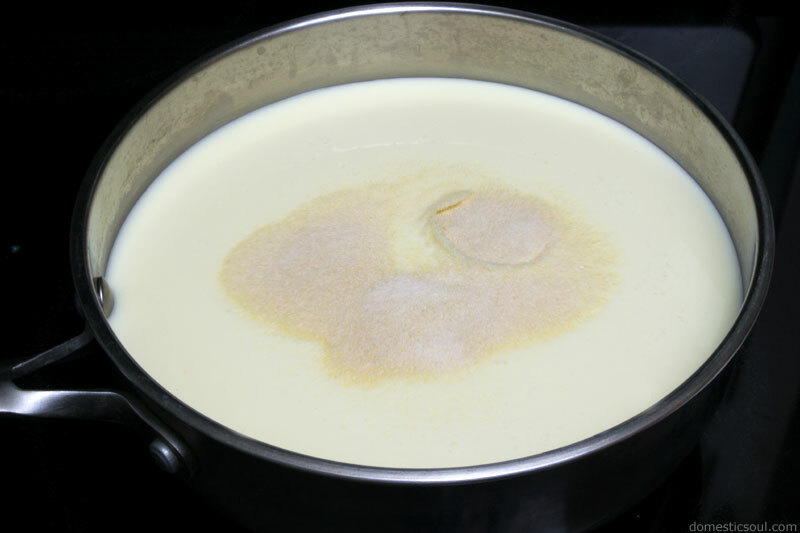 Add the milk and gelatin to a saucepan. Gently heat until the milk reaches 110 degrees. (I usually stop at 105 because my thermometer will go up to 110 from residual heat. Do not go over 110. See notes below.) Stir to fully incorporate the gelatin. No lumps! Add the whey and stir to incorporate. 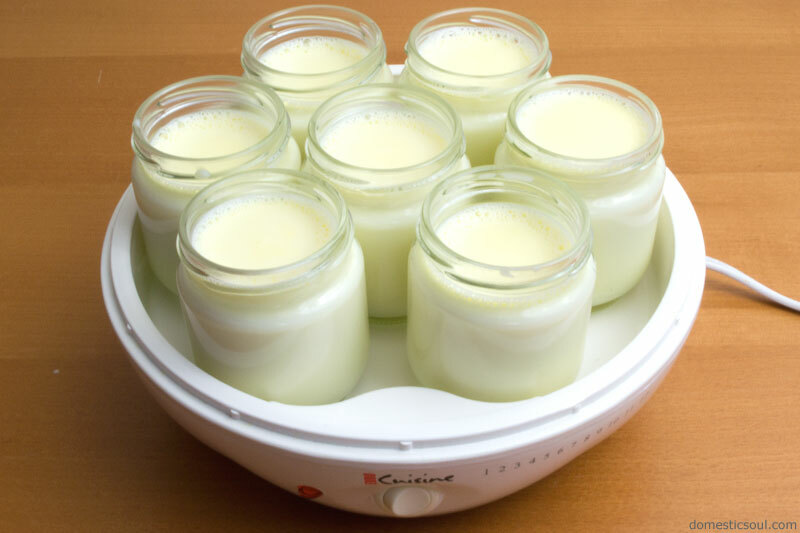 Pour the mixture into the glass jars that came with the yogurt maker – each jar holds 6oz – leaving the jar lids off. Cover the yogurt maker with the yogurt maker lid and turn on. Let heat for 24 hours. After 24 hours, add a lid to each jar and store in the refrigerator. It will thicken up nicely as it chills. Disclaimer: Generally, raw milk is not recommended for people without robust immune systems because it is not pasteurized. The warning on my current jug of raw milk reads “Warning: This product has not been pasteurized and may contain harmful bacteria. Pregnant women, children, the elderly and persons with lowered resistance to disease have the highest risk of harm from the use of this product.” So, you need to decide for yourself whether or not raw milk is a good food to include in your diet. I have only decided raw milk is a good food to include in my diet. 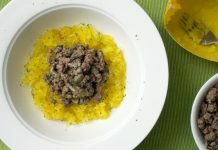 Any risk you may encounter from trying out this recipe is yours and yours alone. I don’t know if you are buying your milk from a reputable source, if you have sufficiently sterilized your tools/yogurt maker or if you did something else to introduce bad bacteria into your yogurt. So, use this recipe at your own risk, but please… do your research and be careful! I enjoy cooking, crafting, gardening, and just generally making things from scratch. 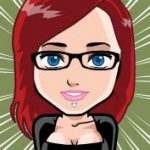 Come hang out and create something with me! I just got a Euro Cuisine yesterday and made yogurt over night. At 8 hours the center jar was 126 degrees and the outer jars ranged from 110 to 117. At what temp is it supposed to incubate? It’s Illegal in my state to sell or buy raw milk. While this recipe may yield a thick product it is not yoghurt, but rather cultured milk. 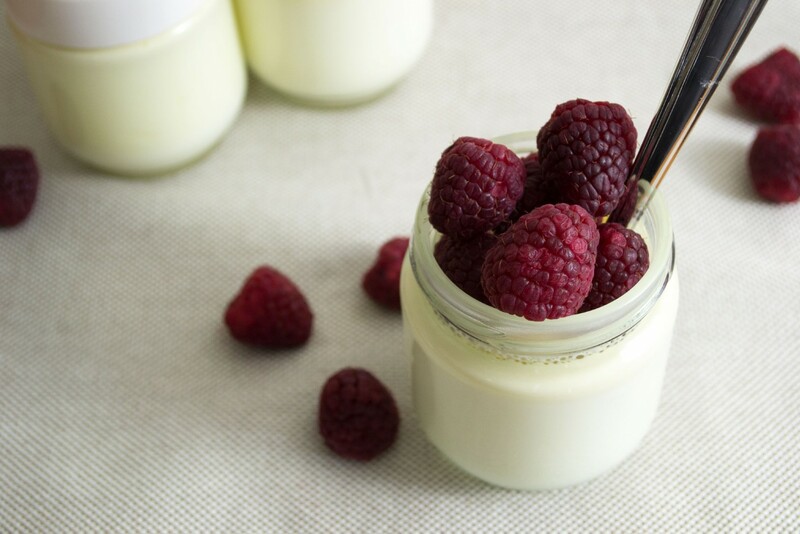 Yoghurt must be heated to 180F to stop competing bacteria (harmful, beneficial or neither) from smothering the lactobacillus acidophilius and lowering the acidophilius counts. Fermentation for 24 hours reduces the lactose.. Whey also does not contain enough lactobacillus acidophilius to create yoghurt. 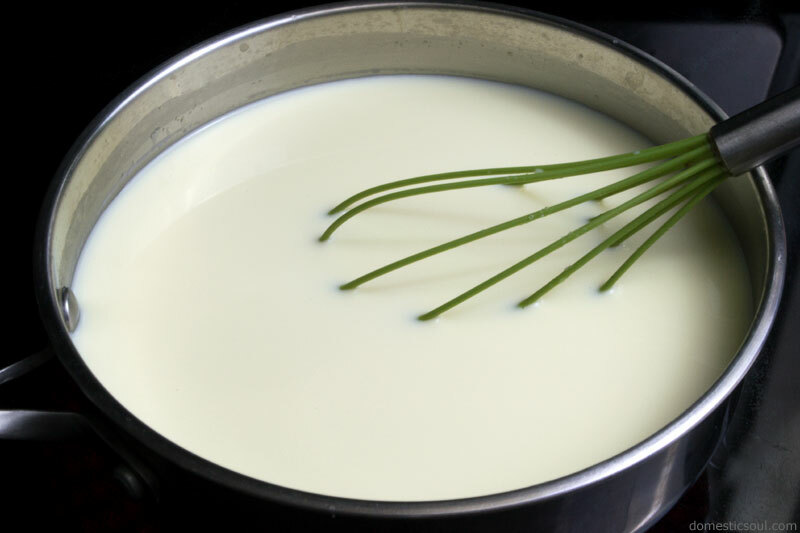 For true yoghurt, use a living yoghurt or culture and heat the milk to 180f. Anything else is cultured milk. I tried this yesterday but all I got was a thick layer of very yellow cream on the top and whey on the bottom. Not sure WHAT I did wrong. Maybe I’ll try your crockpot recipe next and see if I can get better results. They yellow cream on the top is completely normal and will happen on either recipe when you use a cream top, non-homogenized milk (like raw milk). Without homogenization the cream rises to the top. I’m not entirely sure what you mean by whey at the bottom. Did your yogurt separate into layers? If so, check the temperature of your yogurt maker, maybe try adjusting the time to a little less than 24 hours, or try using 2 tablespoons whey instead of 3. What about using whey left over from making homemade raw milk mozzerella? I haven’t made raw milk mozzarella yet, so I can’t be 100% sure on this. But after doing some research, it seems like it would depend on your whey. The Prairie Homestead has an article on things to do with leftover whey and distinguishes between sweet whey and acid whey. While yogurt whey is a sweet whey, according to their list, mozzarella can be either sweet or acid depending on whether or not you add an acid to your cheese recipe. Now, like I said I haven’t tried this (I hate not being able to guarantee results 🙂 ), but it seems like if you make your mozzarella without an acid, it might work. If you make your mozzarella with an acid, it probably wont. They recommend using sweet whey to lacto-ferment vegetables, which is usually what I use yogurt whey for, so that’s what is making me think it would work. Unfortunately, it seems like the best I can tell you is this: I’m not sure. Give it a try and let us know how it works out. AThanks so much for the reply! Yes, I use citric acid to make mozzarella. What if I’m using a powered yogurt starter? The brand I have is yogurmet. How much of the powder do I use if I’m not using a whey starter? I haven’t used yogourmet before, so take this answer for what it’s worth… But according to the yogourmet website, one packet of their starter makes 2 liters of yogurt. 1 liter is a little over 33 fl oz. This recipe uses 42 fl oz of raw milk, so if I were trying out a batch with the yogourmet starter, I’d try a little over half a packet and see how it went. If you give this a try, let us all know how it works out. I’m curious to find out. Awesome thank you!! I will!! I learned about 24 hour yogurt from the Specific Carbohydrate Diet book. 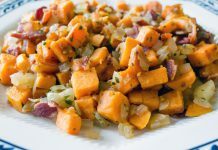 The Specific Carbohydrate diet (or ‘SCD’) is intended to help people with intestinal problems – Crohn’s, Ulcerative Colitis, Diverticulitis, Celiac, etc. 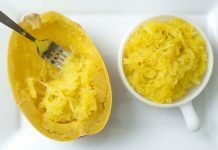 Fermenting for 24+ hours removes all (or nearly all) the lactose so it can be eaten by people with digestive problems. Plus, it gives the bacteria a good, long time to grow so people who are trying to heal their guts get a nice healthy dose of probiotics. If you’re not trying to heal an intestinal issue, you probably don’t need the full 24 hour ferment time. But, since I am trying to heal gut problems, I haven’t played around too much with shorter setting times. To date, I have only tried it once. It was pasteurized, grassfed, non-homogenized (cream top) milk. It was heated to 180 degrees first, since it wasn’t raw. It did have added raw sugar because I was attempting flavored yogurt. And I used a setting time of 10 hours per that recipe. When it was done, the texture came out a little off.. still edible, but had a few lumps in it. But, could that be because of the milk? Because of the sugar? Because of the shortened setting time? Because I didn’t stir in the gelatin as well as I thought I did? Unfortunately, I still need to test more before I can give you an answer on that. That said, I do know other people who use gelatin when making their yogurt and I’m sure they don’t ferment theirs as long as I do since they aren’t following the SCD. So since I know there is a history of using gelatin in yogurt, I would say try it out. It should work. Make sure you stir the gelatin in completely (in case that was my lump issue in my test batch). And let me know how it turns out! Thanks, I’ll let you know how it comes out! I’m going to try 10 hours to start. You should be able to use the goat milk whey for making cow milk yogurt. Usually whey is pretty transferable, in that, you can also use cow milk whey to ferment vegetables, so I don’t see that it would be a problem. No issues using store brand yogurt either. I’ve strained whey from Dannon and Stonyfield before to use as a started when I’ve run out of my own. Both worked just fine. Good luck with your yogurt! Thanks for the response. I used some FAGE greek yogurt with my raw milk and gelatin. I did have an issue with the whey separating from the yogurt while it was in the yogurt maker. I know it doesn’t hurt anything, but I was hoping for a more uniform composition. Do you know what could have caused the separation, or is that normal? I haven’t had that issue with any of the cultures I’ve used (usually Dannon, Stonyfield and this local grass-fed brand I found when I was in Seattle), so I can’t tell you from personal experience. I’ve always had it come out pretty uniform. But, I did some poking around, and found this article from Cultures for health: http://www.culturesforhealth.com/yogurt-starter-troubleshooting-frequently-asked-questions-faq/ Scroll down to the “My yogurt didn’t set properly. It separated into two layers: solid on top and liquid underneath (curds and whey). What should I do?” and “My yogurt seems to have set but there’s a little clear liquid floating on the top and the sides. Is this okay?” questions. I think those should help you out.